The Napoleon St Helena history is remembered 200 years on with a re-enactment of the Emperor’s arrival in 1815 on the HMS Northumberland. This shoot took place on board the Picton Castle, a visiting bark that kindly allowed us use of their upper decks for an afternoon. Merrill Joshua is the local actor. 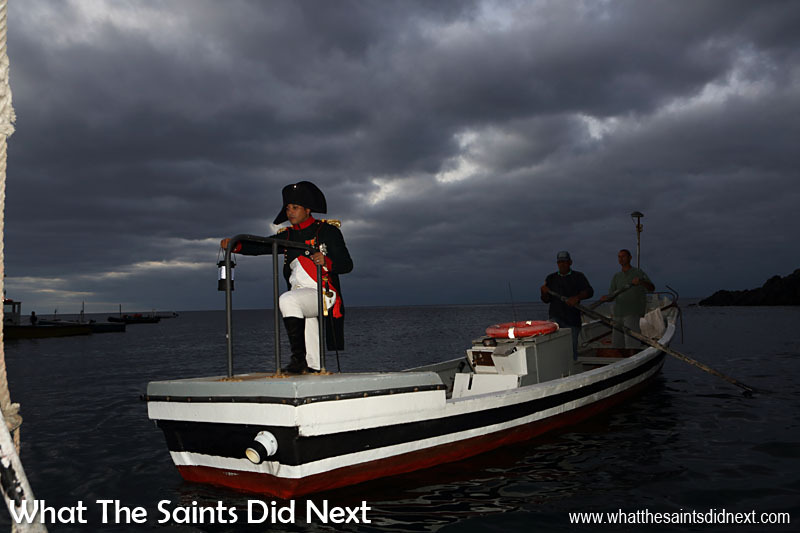 The Napoleon St Helena history began 200 years ago, the island observed the bicentenary with a re-enactment of the Emperor’s arrival and a Royal Navy visit. Two hundred years ago, on 15 October, 1815, the island of St Helena was thrust into the limelight with the reluctant arrival of the world’s top celebrity at the time, Napoleon Bonaparte. After his defeat at the Battle of Waterloo, Napoleon surrendered to the British. Mindful of the escape following Napoleon’s first exile in Elba, the British decided to exile Napoleon here on St Helena, chosen for its extreme isolation in the South Atlantic Ocean. The island had just a few days’ notice of the French Emperor’s arrival. It was the age of sail; news travelled slowly. A month before on 15 September, news arrived on the island of the Duke of Wellington’s victory over Napoleon at Waterloo. 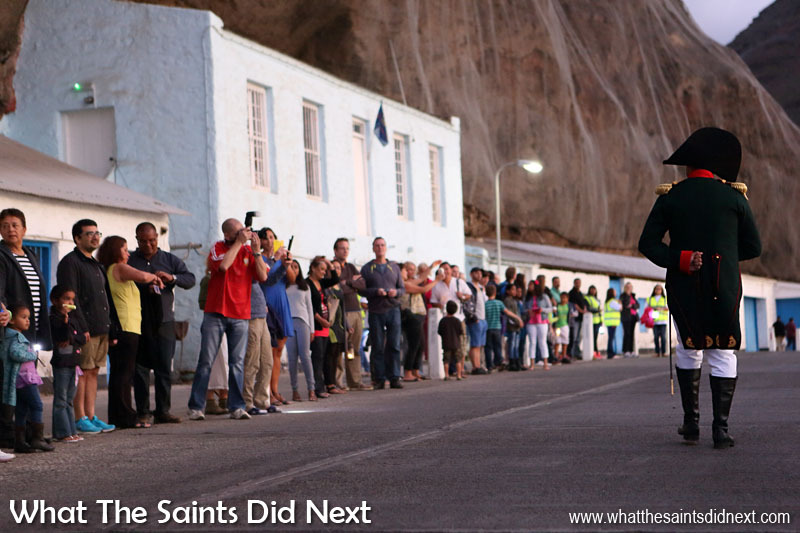 Saint Helena celebrated in style, a Royal Salute was fired and a festival held that granted extra wine allowances. So momentous the event, prisoners were even ordered to be released. As a tribute by the British Navy, the HMS Lancaster and RFA Gold Rover made a special visit to commemorate the 200th anniversary of Napoleon’s arrival. Their programme included tours onboard, taking aerial footage from their Wildcat helicopter and various sporting fixtures against island teams, including football. 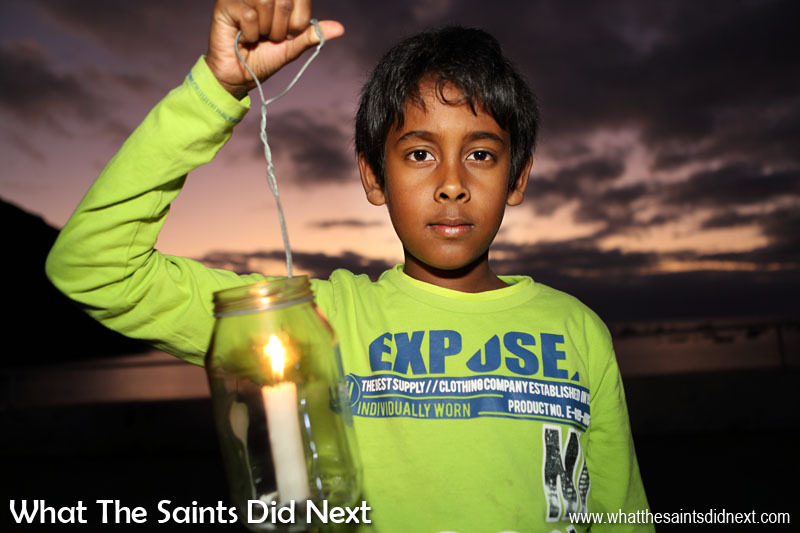 (St Helena won the football). 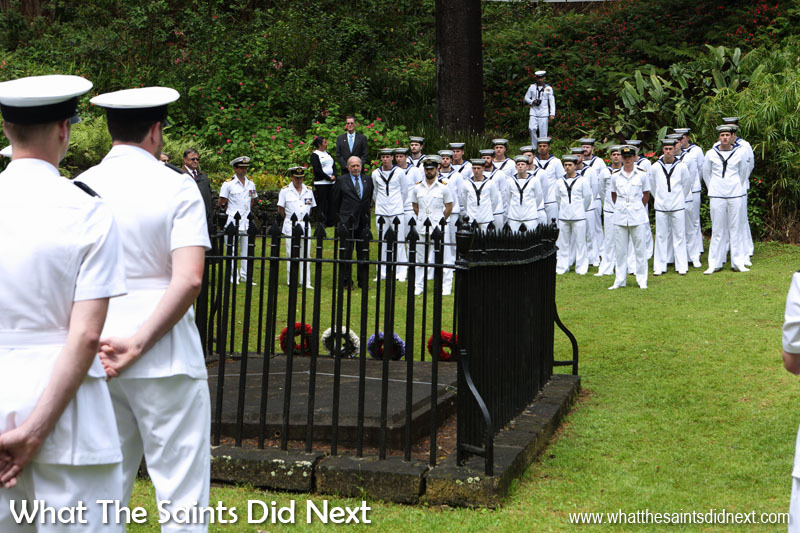 The Napoleon St Helena history, remembered. The Tomb: British Royal Navy vessels The HMS Lancaster and RFA Gold Rover commemorated the bicentennial anniversary with a ceremony at Napoleon’s Tomb. Imagine the surprise when just a few weeks later, on 11 October the Icarus arrived dropping the bombshell that Napoleon was in transit to be imprisoned here on the island. It wasn’t until two days later on the 17th that Napoleon was brought ashore, at the late hour of 6pm in an attempt to avoid the crowds. The ploy failed, however; soldiers had to force a path through the throng of spectators lining the 500 metre stretch from the landing steps up to Porteous House in Jamestown, where Napoleon was to spend his first night on the island. 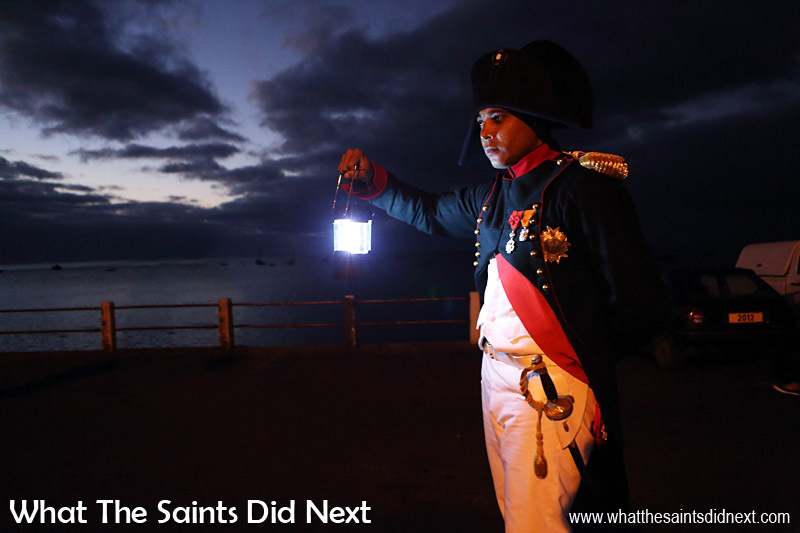 Re-enactment of Napoleon’s 17 October, 1815 arrival at St Helena, portrayed by local actor, Merrill Joshua on 17 October 2015, the 200th anniversary of the event. 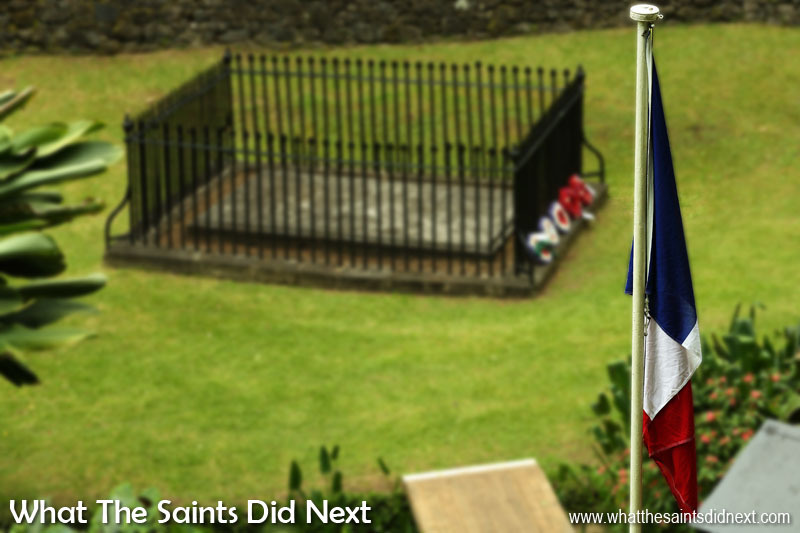 St Helena marked the bicentenary of Napoleon’s arrival with a number of events. This included re-enacting Napoleon stepping ashore, at 6pm on 17 October, 2015, like he did 200 years ago. (Although ‘St Helena time’ made it at 6.30pm!) ‘Napoleon’ was rowed ashore and walked the same path he did in 1815. Islanders lined the way, although not in the numbers as they did two centuries ago. St Helenian, Merrill Joshua as Napoleon Bonaparte, making his way along the sea front to Porteous House in Jamestown as part of the bicentenary re-enactment of the 1815 arrival. The Napoleon St. Helena history. The re-enactment was supported by local people bringing along lanterns to help recreate a flavour of 1815. Thus St Helena’s role in Napoleon’s story began; the incarceration and eventual demise of one of the world’s greatest men. 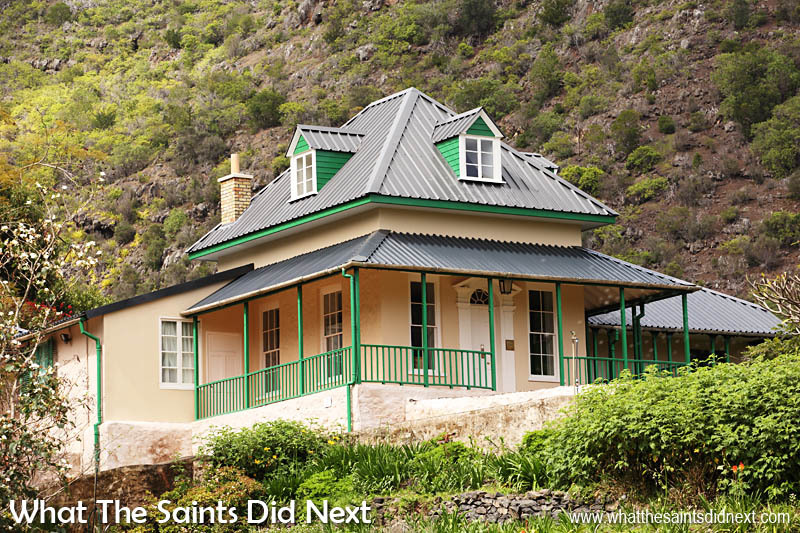 It’s St Helena’s biggest claim to fame which placed us ‘on the map.’ This legacy stands true even today, 200 years on, of Napoleon St Helena history. New Porteous House: For his first night ashore, Napoleon lodged at Porteous House, the largest house in Jamestown. It was home to Henry Porteous, the superintendent of the Company’s lands. The oppressive heat and prying eyes of onlookers made the emperor’s stay intolerable and he moved to the Briars the next day. Porteous House was destroyed by fire in 1865. This is a photo of a replica, New Porteous House built in 2003 on the grounds of its predecessor. The Briars Pavilion: Napoleon lived here for two months whilst waiting for Longwood House to be adapted as his residence. The Briars was home to William and Mrs Balcombe and their family of three children including Betsy. Albeit small, Napoleon occupied the pavilion which stood on the grounds. The cool climate and quiet location suited the emperor. He particularly enjoyed the company of the Balcombes and strolling the surrounding gardens. His time at the Briars is said to be his happiest on St Helena. Longwood House museum is the biggest attraction on St Helena, where Napoleon lived his final six years. The interior has been restored to replicate the house exactly as it was the day the emperor died. 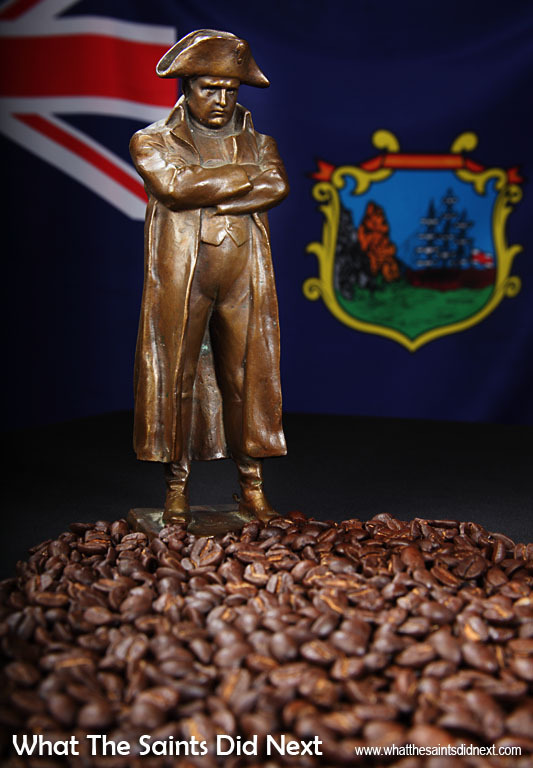 “The only good thing about St Helena is the coffee,” Napoleon supposedly proclaimed. He was an avid coffee lover and a great fan of the island’s green-tipped Bourbon Arabica beans. St Helena coffee is rare and expensive and coffee connoisseurs the world over rate it amongst the world’s best. The Saint Napoleon: Our other photoshoot with Napoleon (Merrill Joshua) 200 years on! This Napoleon however, has obvious physical differences to the ‘real’ one. It was shot at High Knoll Fort and lit by the afternoon sun. The dark natural backdrop rather appropriately reflects the imprisoned emperor’s mood. The Napoleon St Helena history, remembered. During our time in New Orleans we met historian, James McWilliams. He not only impressed us by knowing of St Helena, he also had a story about Napoleon’s exile. “The legend goes,” he began, pleased to have met St Helenians, “being a French city we were very strong admirers of Napoleon. “In fact when the Louisiana Purchase happened in 1803 we were really upset about the fact that Napoleon got us back from Spain and immediately sold the territory to the Americans. The only thing that pacified everybody was they figured he was going to conquer Europe and we’d be French again soon enough. Napoleon House on St Louis and Chartres, New Orleans, USA: This building in the French Quarter was renovated especially in 1820 to accommodate Napoleon after a planned escape commissioned by the former French territory. The emperor died before the plan was put into action. 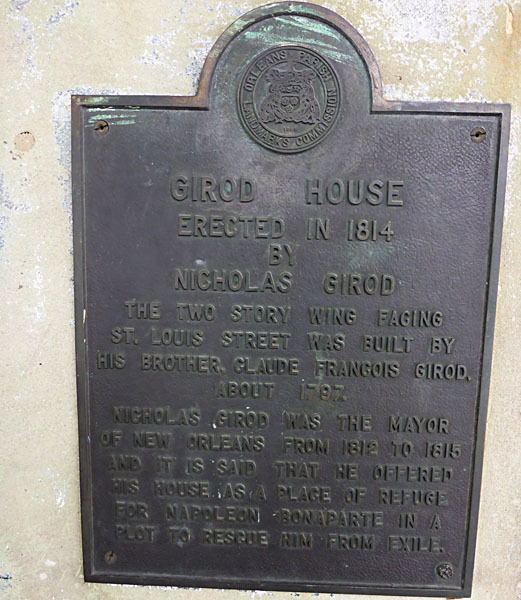 The plaque on the side of Napoleon House in New Orleans. Obviously that’s not the way it worked out. Around 1820 the mayor of New Orleans gets this idea and renovates a three storey building as apartments for the emperor, it’s called Napoleon House. “He contacts the British requesting Napoleon be transferred from St Helena to there. Of course the offer was refused. “The mayor instead hired a pirate named Dominique Youx, a former military subject of Napoleon to sail over to St Helena and break him out by force. 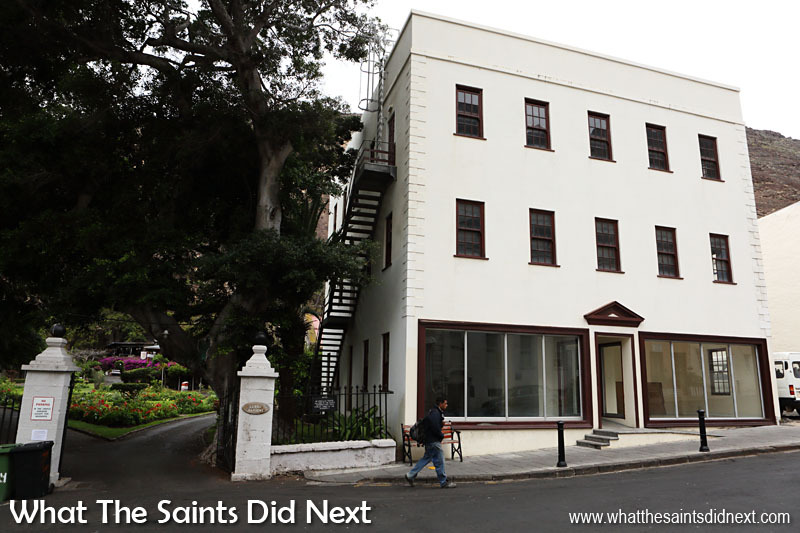 Otherwise, there could have been quite a different ending to our Napoleon St Helena story. The Tomb: Napoleon chose this tranquil spot as his burial ground just days before his death, 5 May 1821. It was a favoured getaway where a natural spring provided water for the Longwood household. Iron railings surround a concrete slab marking the now empty grave. There is no inscription. Napoleon’s body was exhumed and taken to France on 15th October 1840, on the 25th anniversary of his arrival on the island. and another true British hero, Horatio Nelson from the battle of Trafalgar 21st October 1805. Of course 210 year anniversary of Nelson’s victory in Battle of Trafalgar. Certainly a day and a man to remember. I have a relative, Reverend Coldstream Sampson, who reputedly used to visit with Napoleon on St. Helena. Are there any historical records on the island concerning this? Wow how exciting to have a family connection with Napoleon! Our Archives office here might have records about this, we suggest that’s the best place to start. Use the contact details on the government website. http://www.sainthelena.gov.sh/ Good luck! Thanks for the feedback and the link to the fantasy story if Napoleon had indeed been rescued from St Helena. Just checked the synopsis – love the storyline of Marie Laveau bringing him back to health. Amazing that a man 200 years ago captures the imagination even today. 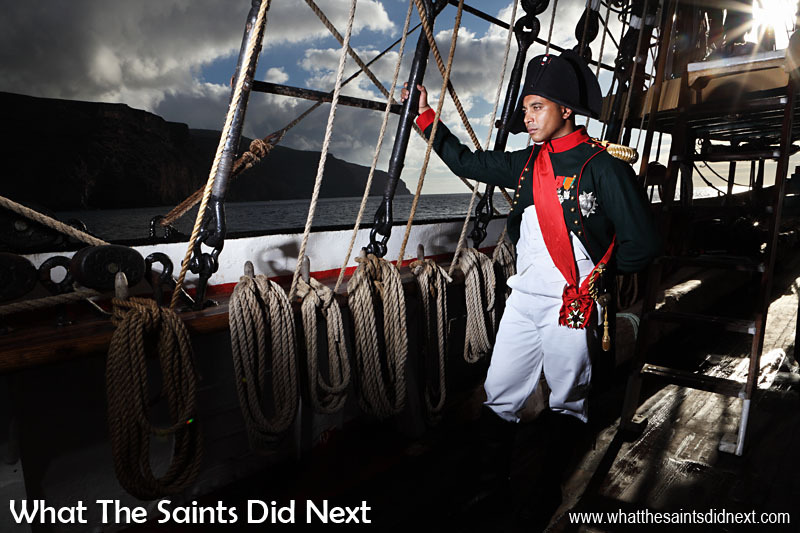 St Helena is marking a significant anniversary, the bicentenary of Napoleon’s arrival. Here are some of photos of the event. Excellent Darrin and Sharon! Was pleased to have been part of that walk as well! Thanks for all the updates. A bientot! Merci beaucoup Pat, hope you brought your lantern? Merrill was brilliant wasn’t he? Really captured the imagination of all the kids present I’m sure. Thanks for the comment, always lovely to hear from you.